In Jalisco, you’re never far from an agave field or the delicious, distilled fruits of the harvest. Grover Sanschagrin, cofounder of the website and app Tequila Matchmaker, possibly might have been weary from the burden of guiding a journalist to some of Jalisco’s best producers. Whatever the reason, the question wasn’t surprising coming from Camarena. At this family-run distillery, the Camarenas are free to make tequila in any way that makes them happy, creatively blending tradition and innovation. Meanwhile, Alan’s father, Felipe, the master distiller, showed off his resourcefulness. Traditionally, piñas—blue agave’s sugary hearts—are steam-roasted until they’re soft and caramelized, then crushed with a tahona, or volcanic millstone. Felipe, who trained as a civil engineer, had jury-rigged his own tahona using spare parts. He flipped a switch, and a studded iron barrel rumbled across a concrete bed, making quick work of the cooked agave. Like his gravity-fed pot stills and rainwater catchment, his tahona was designed for earth-friendly efficiency. It also yields exceptional tequila. El Pandillo’s G4 Tequila Blanco has a buttery, orangey charisma. The ArteNOM Selección de 1579 Blanco tastes of cherry, papaya, and spice, its sweetness partly due to altitude. Grown at 6,100 feet, the Camarenas’ succulents slowly develop rich flavor. Agave ripens faster in the hotter Tequila Valley to the west of Guadalajara, yielding citric, herbaceous notes. So we weren’t the only mammals ducking the heat. The cave’s bats, when they went out at night, would be happy to find some of Fortaleza’s agave throwing up flowering stalks, as they consume the nectar. But farmers usually remove such stalks, lest they siphon sugar from the piñas. This might be good for distilleries, but it’s bad for bats, agave’s main pollinators. Most agave cultivated today grows from baby plants—clones—that spring from the base of larger plants without pollination, but some brands let a few plants bloom, giving bats food and increasing agave’s genetic diversity—a possible insurance against disease. 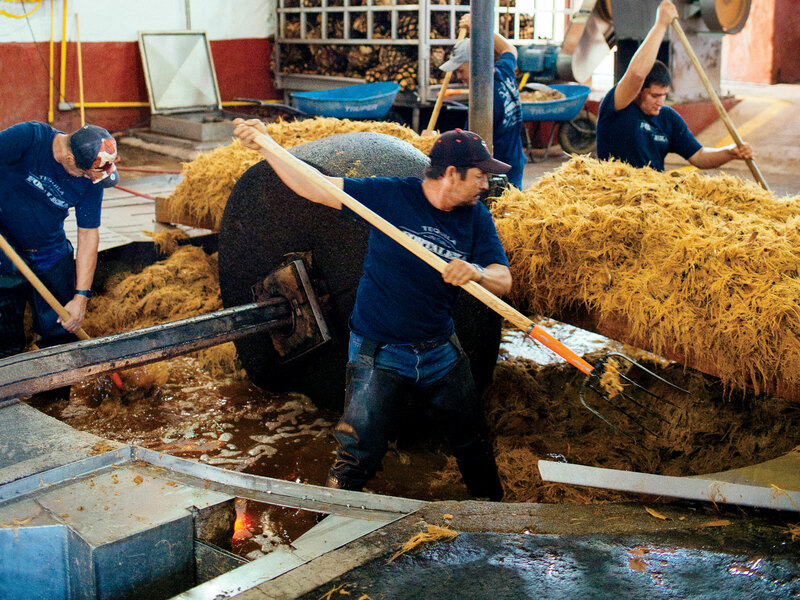 Inside the distillery, a tractor pulled a tahona. The milled fibers would be thrown into the fermentation tanks along with their juice, lending depth. But there are both more modern and more ancient methods. Earlier at Tequila Cascahuín in the nearby town of El Arenal, I’d seen a roller mill spit out fibers, leaving only juice; the resulting tequilas shared a distinct minerally finish. For Siembra Valles Ancestral, though, which Cascahuín is contracted to produce, master distiller Salvador Rosales Trejo uses more rustic techniques. He pit-roasts agave, pounds it with mallets, and distills it in a hollow tree trunk, giving it the smoke-and-berry flavor of an artisanal mezcal. His approach is a far cry from the increasingly industrialized shortcuts that tequila lovers deride: high-pressure autoclaves, starch-extracting diffusers, hydrochloric acid that chemically renders sugars. These methods fill orders fast, but they result in inferior tequila. But not all big-market brands have trashed tradition. Later in the trip, I scored a rare invitation to visit Patrón, a behemoth in the Highlands not far from El Pandillo. Given the 8,000 cases they bottle each day, you would think Patrón would be completely high-tech. But old-school ovens, tahonas, and pot stills are what yield their high-end Roca Patrón tequilas. (The other Patrón labels include both tahona-ground and roller-milled agave.) On the catwalk above an open fermenter, I pushed aside plant fibers to watch the juice beneath bubble with yeast. And I knew from tasting that, once this liquid was distilled, it would come out sweet and smooth, true to the agave’s fruity heart. Chef Francisco Ruano brings French technique to craveworthy fare like a gorgeous crudo in red miso. Stop into this airport-area spot where the specialty is birria, Jaliscan goat stew: Dunk the slow-roasted meat into savory broth, and pile it onto tortillas. arranged group meals featuring little-known village foods like Revolution-era tamales, with nopales pureed into the masa. At filmmaker Guillermo del Toro’s favorite fonda, or market eatery, chile rellenos are served Jalisco-style, swimming in tomatoey broth. Bones lining the walls at chef Alfonso Cadena’s hot spot bespeak the animal focus of communal feasts with dishes like roast beef in habanero cream sauce. 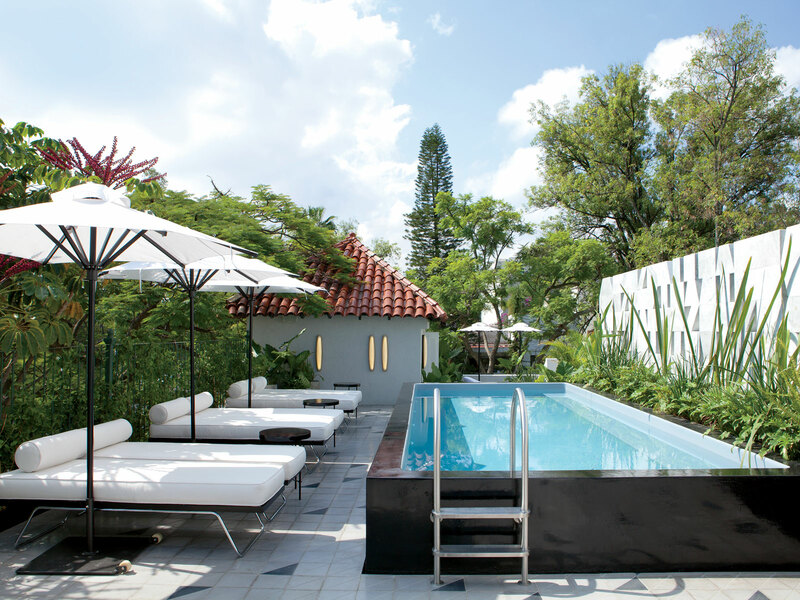 End a balmy Guadalajara day with a grapefruit-and-tequila paloma and a dip in the terrace pool at sleek Casa Fayette (rooms from $105). An organic sunrise breakfast in bed is grand here, too, thanks to the glass-walled rooms that overlook the city. Hummingbirds drink from garden flowers surrounding the poolside suites at mellow Quinta Don Jose (rooms from $80). 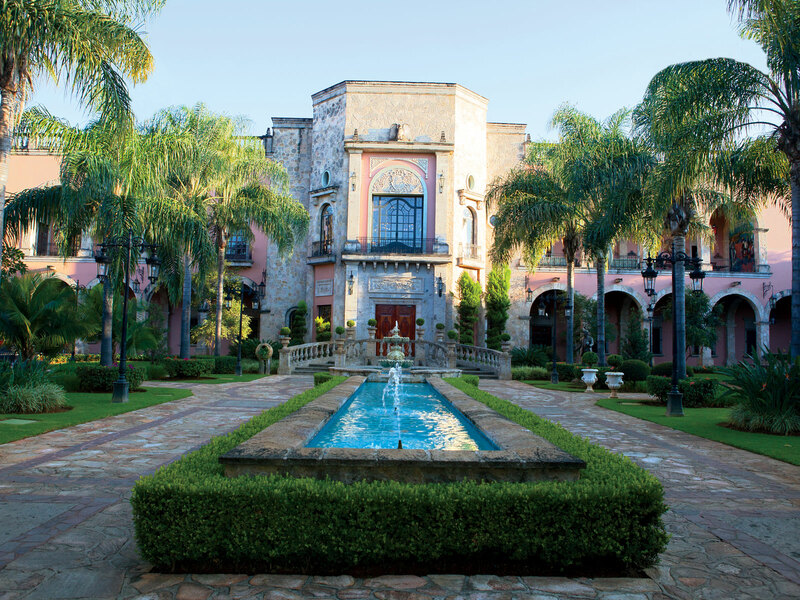 Tequila’s Hotel Solar de las Ánimas (rooms from $130) evokes a Creole Colonial mansion, with vaulted ceilings and a mazelike grandeur. Watch evening descend over cocktails at the hotel’s Sky Bar, then dine on locavore fare at La Antigua Casona, the restaurant downstairs. The budget Mexican airline Volaris flies direct from New York City's JFK airport to Guadalajara, and it connects through Mexico City from other American cities.